The Daily GRRR! HEADLINES. 1. Oil Watch. 2. Canada = Economica Non Grata . 3. Keystone Pipeline. 4. Canadian Income Inequality on the rise and the current situation is SHOCKING. Go to the CCPA Pay Clock: https://www.policyalternatives.ca/ceo . 5. Charlie Hebdo Fall Out 1: Great Diversity and Sharing of Opinions. 6. Charlie Hebdo Fall Out 2: Increased Surveillance. 7. 2000 Nigerians Killed by Boko Haram-related Violence (or: there’s bastards and then there’s bastards) . Welcome, I am your host Trish Holmes and you are listening to The Daily GRRR! January 15, 2015 edition on 100.3fm, CKMS in Waterloo, Ontario. Soundfm.ca on the web. Opening song: The Ramones with Judy is a Punk . The effects of oil’s 57% plunge since June is not of course without consequences. Despite The bank of Canada’s prediction in October that the economy will expand by 2.4% in 2015, all evidence points to that not happening. There are rumours that the Bank of Canada is going to cut interest rates. And the Canadian dollar has recently dropped to about 84 U.S. cents and the Conference Board of Canada has said the spending and job cuts may push Alberta into a recession. Suncor Energy Inc., which said Tuesday it would eliminate 1,000 jobs. CNR has slashed 2 billion off its books. So the sky is falling. So much for Harper’s economic prowess, turns out he might be a one trick pony after all. Now granted very few if any people seem to have predicted the fall in oil but he consistently has negated those who opposed his interest in Alberta for either reasons of financial caution or the environment. Remember he refuses to even acknowledge climate change exists, his reluctance to engage with emissions regulation (only last month Harper called the prospect of regulating the industry at this time "crazy."). Whether Trudeau or Mulchair would do any better, who knows, this may be bigger than one party. But in 2006, Harper said Canada was an “emerging energy superpower,” and he has pretty much staked his government on developing Alberta’s tar sands. So it’s election year, let’s hope his gamble fails miserably. As predicted The Republican controlled House of Congress in the US passed a bill last week approving the construction of the controversial Keystone XL pipeline. And The Senate is expected to pass a similar bill soon, although they look to be stalling somewhat. The Senate leader has announced any amendments to the bill will be considered, which may take weeks. Despite passing, the bill failed to garner the two-thirds majority in the House that it would need in the future to override a presidential veto. The Senate looks unlikely to be able to override a veto as well. 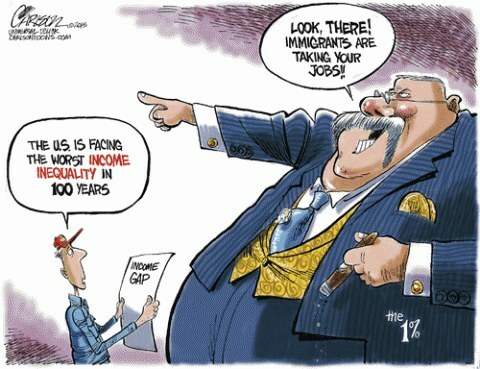 In the past few days, there have been a number of reports on income inequality in Canada. Namely that Canada's top 100 CEOs earned on average $9.2 million in 2014, a 25 per cent increase over the period from 2008 to 2013 inclusively! The CCPA has set up a pay clock on its web site, (https://www.policyalternatives.ca/ceo) comparing in real time how much Canadians are earning, on average, in relation to CEOs. By noon on January 2, 2015, the average CEO pay had eclipsed what most Canadians make in a year! When I looked on Wednesday evening, the earned pay thus far in 2015 for the average worker was $1750, the earned pay thus far in 2015 for an average CEO was $359,220. Last month the Toronto Star reported that Canadians drastically underestimate the country’s wealth gap but still show broad support for policies such as higher income taxes to address the problem. They are quoting from an online poll from the Broadbent Institute. The Star reports on data that show the richest segment of Canada’s population controls close to 70 per cent of the country’s wealth. Its very poorest segment has no share at all. Whereas findings from the online poll show that Canadians believe the richest fifth of the country own about 55 per cent of wealth, and thought the poorest fifth held about 6 per cent. The study indicated that almost 80% were in favour of introducing higher corporate taxes whereas under Harper the corporate tax rate has dropped from around 22 per cent to 15 per cent. An earlier report from the Broadbent Institute issued in September used Statistics Canada data to show that the top 10 per cent of Canadians saw their median net worth grow by 42 per cent between 2005 and 2012. Meanwhile, the bottom 10 per cent of the country saw their median net worth shrink by 150 per cent. Well the fall out of the Charlie Hebdo killings in Paris has been something hasn’t it? The exchange of opinions, whether anyone is actually listening or not is a whole other question. There was a great piece in Mondoweiss (http://mondoweiss.net/2015/01/moral-hysteria-charlie#sthash.KocQjrOW.sWU...) entitled the Moral Hysteria of Je suis Charlie by Brian Klug which asks what people who are marching for free speech would have done if a man had jumped in front of them with a sign supporting the terrorists. The piece is written to explore the idea that everyone has their limits and how easy it is to be swept away by self-righteous moral passion. It’s an interesting debate and one that was discussed on the second half of the show last week. What the fall out of the all the killings means in France is obviously very different to what it means in the rest of the world. In our fine country Mr Harper, while expressing sympathy and solidarity with France, also said a new anti-terrorism bill giving the state additional powers to watch, detain and arrest extremists will be tabled shortly after Parliament resumes in late January. Now this was predictable. On the subject of terrorists, the massacre of 2000 people in Nigeria last week had shocking paucity of news headlines. Now I cannot describe the attacks, I’ve read some of the descriptions and their too horrible to repeat, they’re barbaric, savage and unbelievably shocking. Boko Haram (which translates to "Western education is forbidden"), is a militant Islamist group in Nigeria and on January 3, the group began an assault on the town of Baga a northeastern town near Chad. While the Nigerian government said 150 died in the attack, other estimates of the death toll ranged from hundreds to some 2,000 people. By some reports, 30,000 people have been displaced. On Saturday, a suicide bomb attached to a 10-year-old girl killed at least 16 people. There are up-coming elections in Nigeria on Feb 14. Boko Haram wants to force the country’s electoral commission to cancel or indefinitely postpone the vote. The Nigerian President Goodluck Jonathan and his government have been accused of underestimating deaths attributable to Boko Haram to deflect political criticism. Less than 24 hours after the Charlie Hebdo massacre in Paris, President Jonathan publicly declared his sympathy and stated that is was a cowardly and ignoble attack and a monstrous assault on the right to freedom of expression. Yet over ten days after the violence in Baga began, Jonathan has not publicly acknowledged that the attacks had even happened, though a spokesman for Nigeria’s defense ministry issued a statement questioning the “exaggerated” death toll estimates, dismissing them as “speculation and conjecture.” The United Nations, the United States and other countries have condemned the violence by Islamic extremist group Boko Haram, and international aid groups are mobilizing to help survivors. Now because oil is the main theme in this week’s show. A steep fall in oil prices have deeply affected the government revenue and even before the drop in oil prices, Nigeria has been struggling with severe electricity generation concerns. Though Nigeria is Africa’s largest oil producer, as of 2012 half of Nigeria’s 170 million people have no access to electricity whatsoever. As a frame of reference The West African Ebola outbreak has killed roughly 8,400 people so far. That’s by far the biggest Ebola outbreak ever, yet there are estimates that over 10,000 violent deaths between November 2013 and November 2014 have occurred because of Boko Haram-related violence. The conflict has displaced more than 1.5 million people, and with more than 20,000 square miles under its control, Boko Haram-held territory is larger than Switzerland. Now we are moving into the feature portion of our broadcast. Over the last few months, I’ve talked a lot about the price of oil and the economy. As a society over the last century, the economy and economists have become important cornerstones. Economics has spanned from Thomas Malthus, who had some negative views about the poor and how to assist them to Thomas Piketty whose book Capital in the 21st Century calls for a tax on the rich. Now every field of study evolves and that god for that but does economics deserve its elevated status? This NPR Planet Money podcast explores this issue. The Daily GRRR! is supported by the Community Radio Fund of Canada and CKMS. Stay tuned in for more Grand River Radical radio .